Business sense suggests you try to buy property at the lowest possible price, but that was not the case for one property in Sydney, Australia. It was just bought by Chinese buyers for A$88,888,888.88. The number eight is considered lucky in Chinese as it sounds like the word for "prosperity". That luck might come in handy - the deal comes just as Sydney was awarded the fourth spot on UBS's global housing bubble index. Sydney follows Vancouver, London and Stockholm in the ranking which seeks to identify the world's most risky real estate markets. The lucky price of A$88,88m (US$68.2m; £52.5m) bought 333 Kent Street in Sydney's central business district. Fortunately it's not a triple four address, as four is pronounced similarly to the word "death" and so considered unlucky. The offer was made by Chinese firm Bridge Capital and Australian iProsperity Group, who plan to turn the property into a residential building and hotel with a view of the Darling Harbour. "This is not the first time that Chinese buyers have chosen to offer a price that includes numbers that are considered lucky," Vince Kernahan of Colliers International, the real estate company handling the sale, told the BBC. In this particular case, "the buyer's offer was very close to several other offers. They just chose these numbers for luck and as it turned out their luck was with them". According to Swiss bank UBS, the housing market in Sydney "has been overheating since the city became a target for Chinese investors several years ago". The bank's annual housing bubble index looks at real estate markets around the world to spot the ones where the price rise is "out of touch with fundamentals" and "out of proportion to differences in local economic growth and inflation rates". The report said housing prices peaked in the second half of 2015 and since then been slightly corrected. But the growing demand from foreign investors has led to the residential market "tripling in value over the last three years." "Increasing supply and further tax measures to reduce foreign housing investments may end the price boom rather abruptly." According to the UBS index, Sydney is followed by Munich, Hong Kong and San Francisco. Could shared ownership help Sydney's housing affordability crisis? 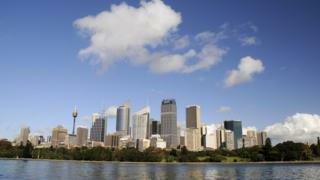 China and Australian housing: Splurge at an end?